I first heard about this festival at work. One of the students dropped in a copy of the brochure for everyone to pass around and look at. I was surprised by the unenthusiastic response of my colleagues, but jotted it down in my diary anyway. When I woke up this morning, I still had doubts about attending. It was a grey and cloudy morning, I was tired and comfortable in bed, and I didn’t really want to sit on the train for over an hour to get to Shizuoka. But, I kicked myself out of bed and looked for my spirit of adventure (which has been hiding of late!). I’m so glad I made the effort! The event was huge – much bigger than I expected! 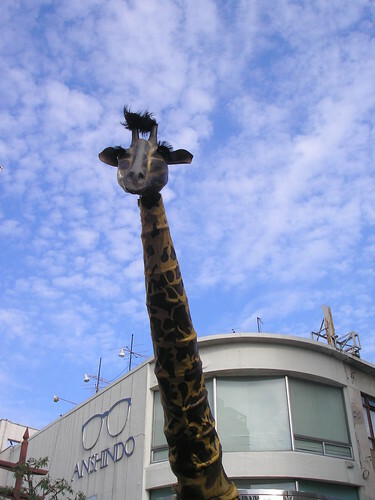 As I arrived at Shizuoka station, clutching my empty coffee cup, I made my way to the tourist information centre. I had been to Shizuoka once, but wanted a map just in case I couldn’t remember the way to Sumpu Park (where I had heard the main events were taking place). I needn’t have worried really though, as I could have easily just followed the crowds, stalls and performers which lined the way. Anyway, the nice lady in the tourist information centre (who spoke English!) gave me a map and drew the best route on it for me. 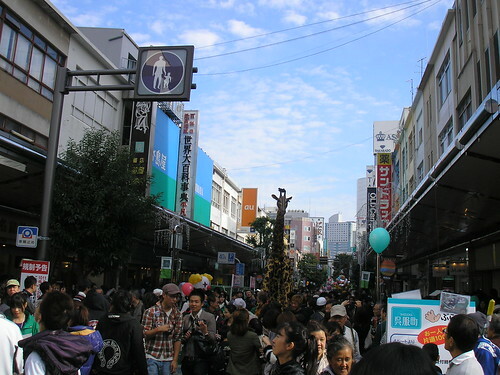 Off I trotted, and before I knew it I was on Gofukucho-dori, right in the throng of things. 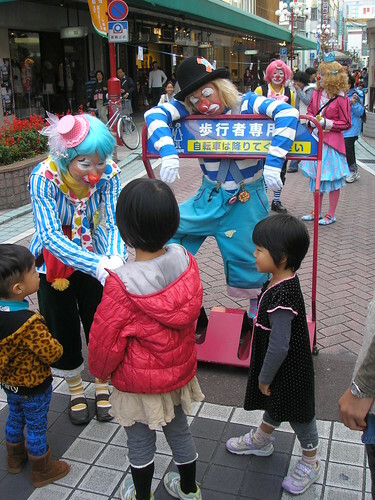 One of my first encounters was with a dead-looking clown. 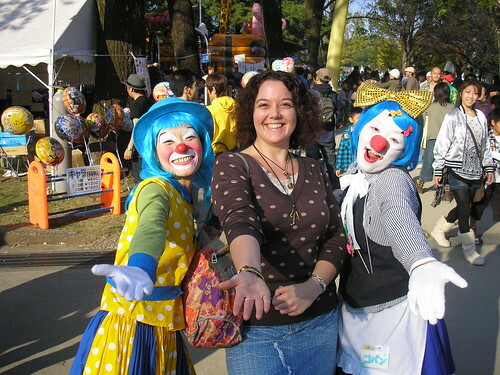 I’ve never been a huge fan of clowns (I think most of my generation were put off by Stephen King’s It), but these ones were pretty harmless. 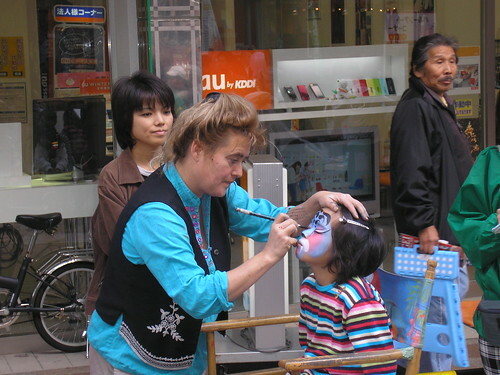 The performers and entertainers came from all over the world, like this face-painter, Lucie Brouillard, who is from Canada. 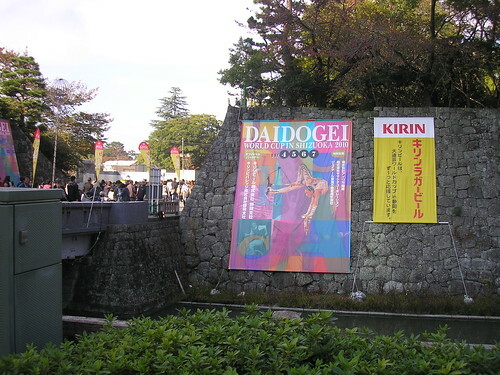 One of my students had warned me about the expected crowds at Daidogei. 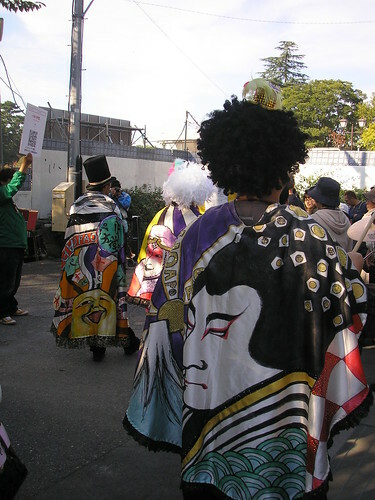 I should have guessed that, despite the crowds, being Japan, it would be incredibly organised. The cunningness of the audience amazed me, too. 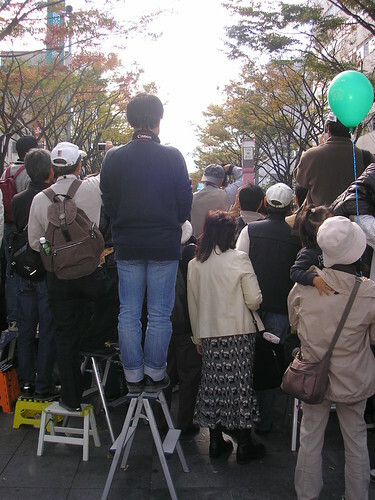 Lots of people came very well equipped, with plastic sheets to sit on, and ladders to climb up on! The volunteer staff did a really good job of keeping the people with ladders a fair distance back so, actually, it wasn’t too hard to see. I was glad I went to the event on my own, as it meant I was able to duck in and out of small spaces and see a lot more than if I had been with a big group of people. 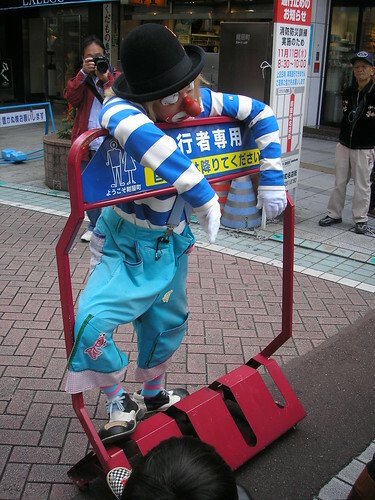 He was pretty funny, a great mime artist, and did some clever sleight of hand tricks. 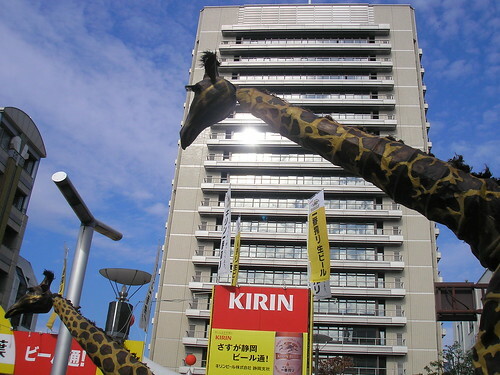 Three huge, freakily life-like giraffes were just wandering along the street. They were awesome and gorgeous! 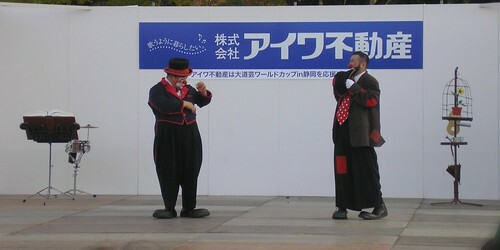 Sumpu Park was bursting at the seams with entertainment, and seemed much bigger than the last time I visited. 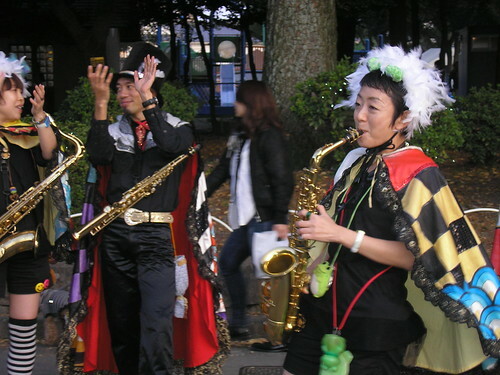 As soon as I entered the park I walked into a musical troupe called Pao Pao-Do (パオパオ堂). Their costumes and music enchanted me and, actually, I ran into them again at the end of the day as I was leaving the park, which was a bit of a bonus! 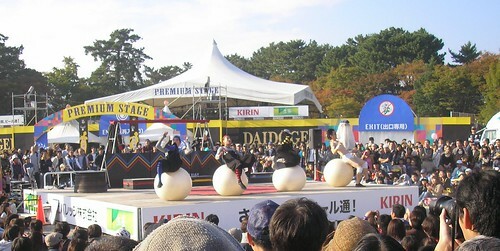 I saw so many acts while wandering around the warm, sunny park. At the time, I had no idea who I was watching or how famous they were. I decided not to plan anything, and to just wander between acts. That way, I wouldn’t be disappointed if I missed something. It turns out, I was very lucky and actually saw some brilliant acts, some of which were pretty famous, too. From Mexico. Princess Elayne was the special guest at this year’s event, after being the world champion last year. She was mesmerizing! 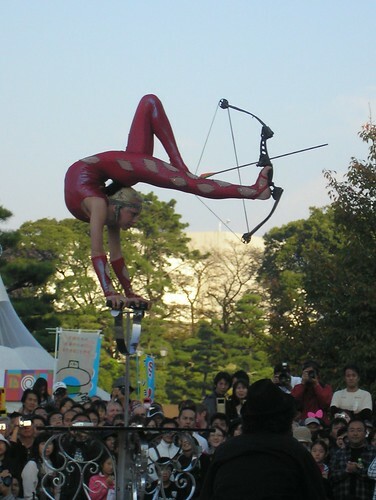 From Japan. 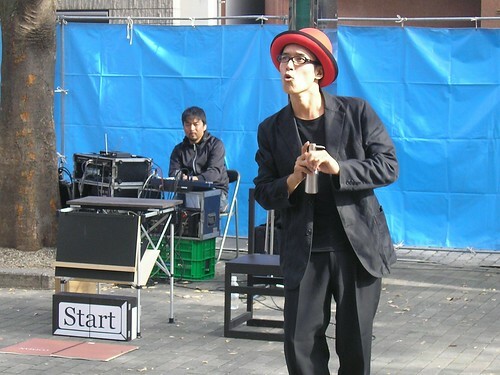 This guy juggled with so many random objects. 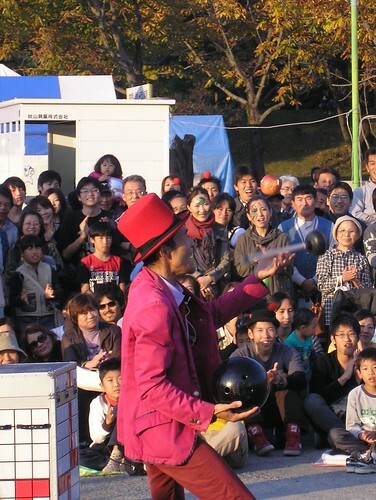 In the photo below, he is juggling with an apple, a bowling ball and a plunger! He also took bites out of the apple as he was juggling! 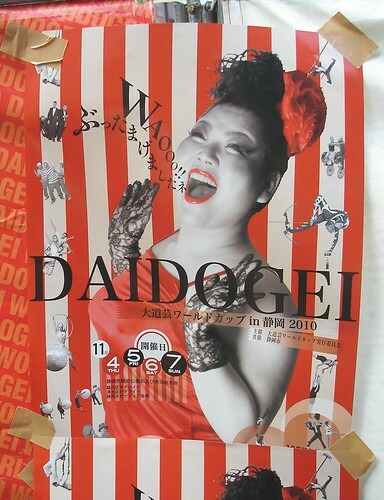 Finally, one thing I noticed about Daidogei was that it holds one similarity with the UK’s Red Nose Day. 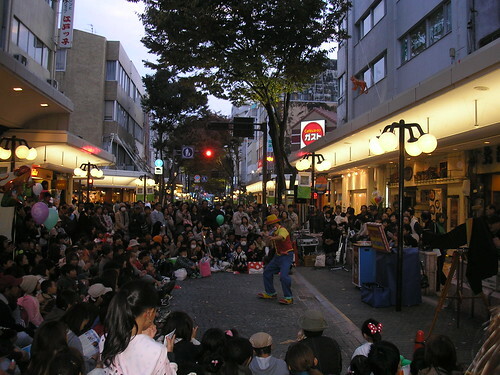 The event is, as far as I know, not for charity, but certain merchandise and goods are sold… including red noses! 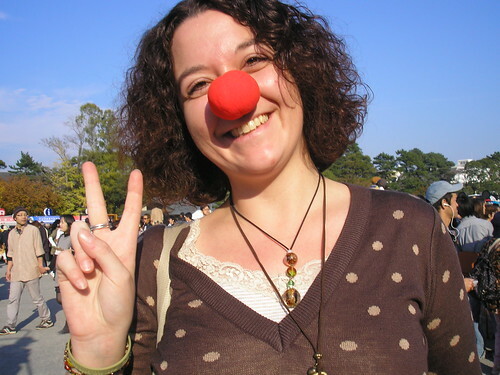 Well, I’ll keep mine handy for Red Nose Day 2012 when I’m back in the UK! Other good are sold, including antenna bopper headbands featuring two red noses, Japan’s favourite “eco bags”, and… this gorgeous Hello Kitty doll which I just couldn’t resist!! 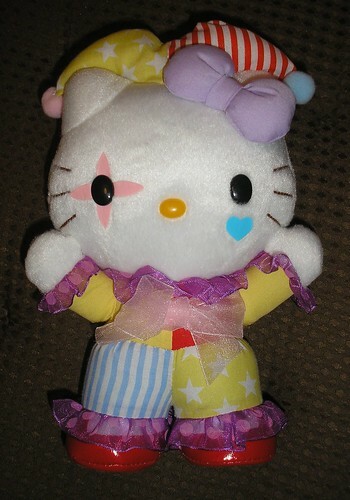 This is an official Daidogei Hello Kitty (made in 2008). 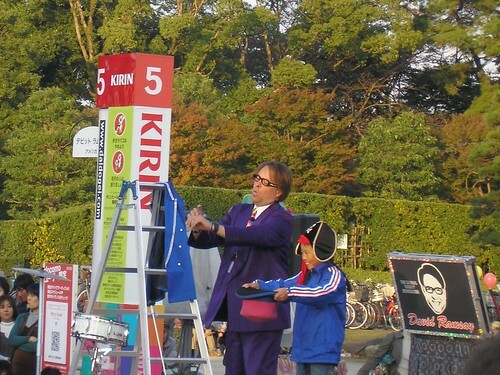 The original selling price was a whopping 1,800 Yen, but then were selling them for just 500 Yen! Bargain! My full collection of photos can be viewed, as usual, on Flickr.